A good friend of mine just landed a fab new job. It’s nice to be a freelance creative, flitting about all willy-nilly and having the freedom of fluidity. But it’s also nice to have a regular job and not wonder where your next paycheck is coming from or when you might be paid for the good work you’ve already done. My friend is happy. And I am happy for him. 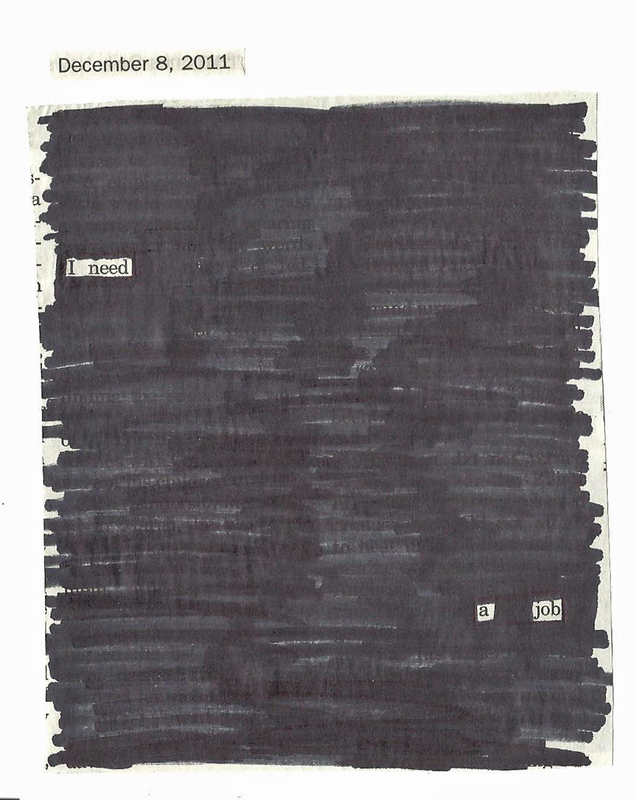 Today I tried my hand at the “Newspaper Blackout” technique employed by Austin Kleon, whom I first learned about via 20×200. This entry was posted on December 8, 2011 by AK in 365 Days of Print, alaska, art, musings and tagged 20x200, 365 days of print, alaska, art, austin kleon, christmas, collage, daily news miner, economy, job, musings, unemployment.